TP-Link is a brand most often associated with low-cost, mid-tier routers that are good value for money. It’s something that we’ve identified in our past reviews, and something that’s certainly travelled via ‘word-of-mouth’ in forums where such things are discussed. Now TP-Link has upped its game when it comes to performance and price bracket, with its Archer C9 wireless router hitting an 802.11ac rating of AC1900 and costing $179 from most online stores. Guess what, though: it’s still very good value for money. It’s one of the many AC1900-rated dual-band routers that are currently on the Australian market, and this means that it can do 802.11ac at 1300Mbps, and 802.11n at up to 600Mbps. It has three external antennas that are removable, and they support the good stuff we’ve heard about from other high-end routers, such as Beamforming, where the signal can be directed to a particular device’s path, rather than going all over the place. Certainly, the speeds that we got from the Archer C9 were impressive. From a short distance of between 2-4m, the router consistently transferred files at rates well over 40 megabytes per second (MBps), and sometimes hit 50MBps depending on the laptop that we were using at the time. Note that you do need laptops and desktop PCs that have 802.11ac wireless adapters in them to get the most out of this and other 802.11ac routers. Many recent flagship smartphones also support the standard. We ran this router for a little longer than we usually do for our evaluations, keeping it going for almost seven weeks, running a network comprised of three wired devices (two Gigabit NAS devices and a Fetch TV set-top box -- the router has four Gigabit ports), as well as a plethora of wireless devices, including a couple of laptops, smartphones, an iPad, and various other network-reliant bits such as a LIFX LED bulb, a Chromecast, a WEMO switch, and Qualcomm AllPlay-based speakers. It’s fair to say that the Archer C9 handled the whole network without any hints of suffering as it kept us ticking along on a daily basis, both for our work and entertainment needs. During our entire evaluation period, we didn’t have a need to restart the router at all; there was never a lull in our Internet connection (which came through to the router via a TP-Link modem-router set up in bridged mode since the Archer C9 is a router only), and the 2.4GHz and 5GHz wireless networks were consistent in their operation. That is, they were always available and offered solid speed. The only time we were disappointed by this router was when it came time to do our mid-range distance tests -- though perhaps our expectations were too high, as they generally are for new routers. Covering a distance of 15m has been a tall order for many routers in our particular testing environment, and while the Archer C9 did well overall, the hit in performance was significant. Casting our mind back to the quick transfers we experienced from close range, which we officially recorded at 42.90MBps for large files (totalling 6.6GB) and 21.56MBps for small files (totalling 8.4GB), the 14.81MBps for large files and 15.31MBps for small files from 15m away isn’t all that impressive. For comparison, the D-Link Viper recorded about 17.05MBps for large and 15.71MBps for small files in our 15m tests. It was also faster in the short-range, small file test, giving a rate of 32.98MBps compared to the TP-Link’s 21.56MBps. Note that the D-Link is a much more expensive router, costing at least $100 more at the time of this review. Transferring large files (video files) from close range. Transferring large files from a mid-range distance. Transferring small files (MP3s and FLACs) from close range. Transferring small files from a mid-range distance. However, the TP-Link was consistent. It kept hitting the same marks and didn’t let us down in transferring the data. Our laptop for these tests was a Lenovo ThinkPad Yoga with an Intel Wireless-AC 7260 module that connected at 802.11ac speeds, and we’ll note that other laptops we tried (but which aren’t part of our usual test gear) such as the Dell Latitude E5250 and the HP Spectre x360, recorded shot-range rates close to 50MBps, and often exceeded that mark in bursts. Basically, this is a more than capable router to consider if you want to hit high speeds with your 802.11ac computers from a short distance -- and especially for large file transfers such as movies. While its speeds in our particular tests dwindled from further distances, that’s not something unique to this router, and the speeds you’ll get in your own environment will vary. For covering longer distances, things such as repeaters and powerline adapters are still needed, and many networking companies are now spruiking them as part of their overall networking ecosystem for busy households (that is, households with lots of wireless devices). 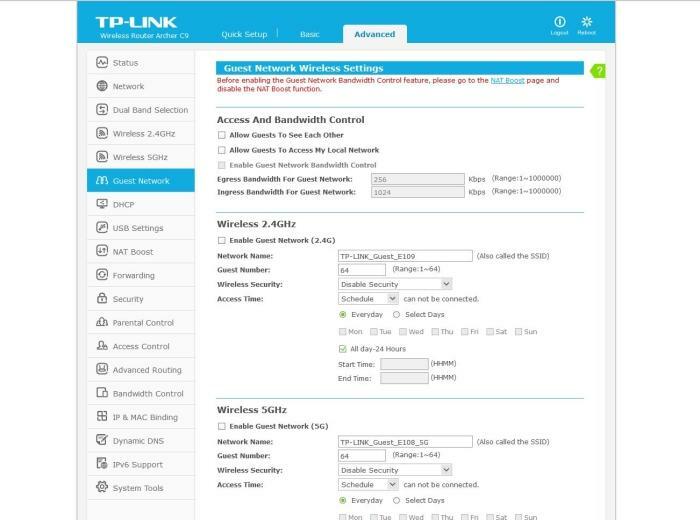 As for ease of use, the TP-Link Archer C9 offers a cleaner interface than older TP-Link routers, with more basic information given by default, as well as a nice map of your network so that you can see at a glance what’s connected. Setting it up took us a few minutes when you take out the time we took untangling cables from our existing gear to get it physically connected; we simply logged in to the router on our laptop via the wireless network (using the default password that’s supplied), popped in our Internet login details, changed the wireless networking settings to our requirements, and that was that -- all through the ‘Quick Setup’. There is built-in quality of service (QoS) management in a setting called NAT Boost, which is enabled by default. Throughout the course of our testing, we didn’t have cause to change this. Netflix and NBA League Pass streamed without issues while we browsed the Web and used YouTube on a second screen as normal, though background downloads onto our NAS devices did sometimes present slow-down issues that affected real-time video streaming needs. We found it easier to just throttle these downloads in the NAS device rather than using the QoS in the router, which would have required switching off NAT Boost and creating custom bandwidth rules according to IP addresses and ports. The 'NAT Boost' setting is supposed to take care of QoS without any user interaction. 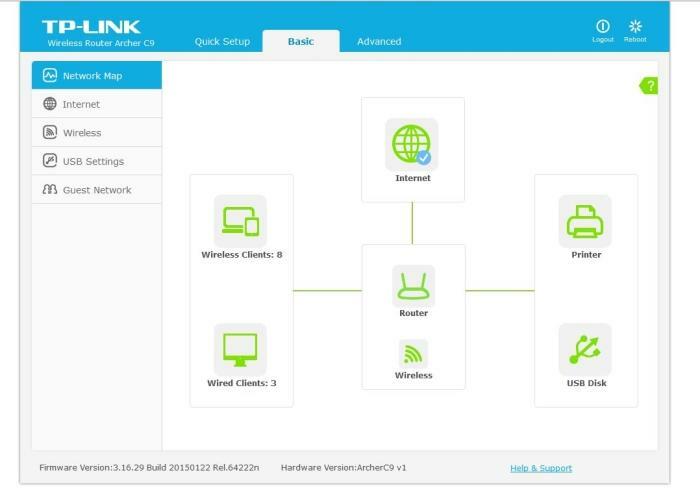 If you’re the type who tinkers, you can certainly put your tinkering to good use on this router, and its interface is cleanly laid out with a menu listing along the side. In the ‘Advanced’ interface, things such as port forwarding are easy to do, as are dynamic DNS settings (No IP and DynDNS). We will note that the built-in help description, while nicely implemented, don’t actually give an insight into what most features actually do. Rather, they mostly indicate that things can be enabled or disabled. A general view of the advanced interface. Parental controls can be applied according to MAC address, which you can glean from the router’s DHCP client list. These controls offer the ability to create a ‘whitelist’ of sites that will be accessible by each affected PC or mobile device. It’s a feature that didn’t work properly for us during our tests, as it basically blocked everything instead. A couple of USB ports (one 2.0 at the back and one 3.0 at the side) allow the router to be a connection point for a printer and a USB hard drive. A hard drive plugged in to the router with media on it can be scanned and its content found through DLNA-capable devices and apps. Overall, it’s a swift router (both in terms of close-range wireless speed, and the responsiveness of changes made to its interface), that stands tall -- literally. It has a nice enough design to be used out in the open near a home entertainment unit, for example, with blue LEDs that aren’t overbearing, and we found it to be a reliable performer during our prolonged tests. A couple of blemishes are its parental controls, which didn’t seem to work for us, and its storage sharing, which was mainly accessible via FTP and DLNA devices, but not over our Windows network. For the price, though, it’s a worthy AC1900 choice. Read more: TP-Link Deco M5 review: Mesh Wi-Fi that more than "just works"